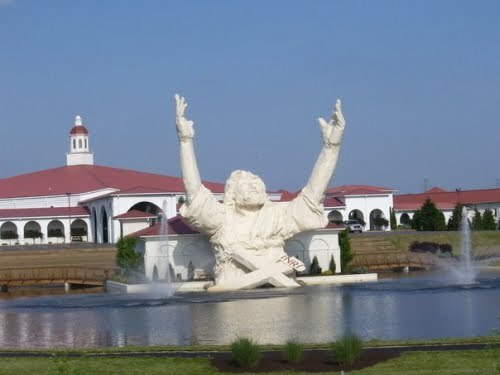 Thanks to a lightning strike, the six-story "King of Kings" statue (nicknamed "Touchdown" or "Butter" Jesus) visible from Interstate 75 is no more. The plastic foam and fiberglass structure burned the ground last night, leaving nothing but the steel frame. Chase and I once enjoyed a McDonald's picnic on a bench next to the pool while returning to Hillsdale from Louisville in 2007, as members flocked to an evening service at Solid Rock Church. The pastor has said the church intends to resurrect the structure, which was erected in 2004 at a cost of $250,000. 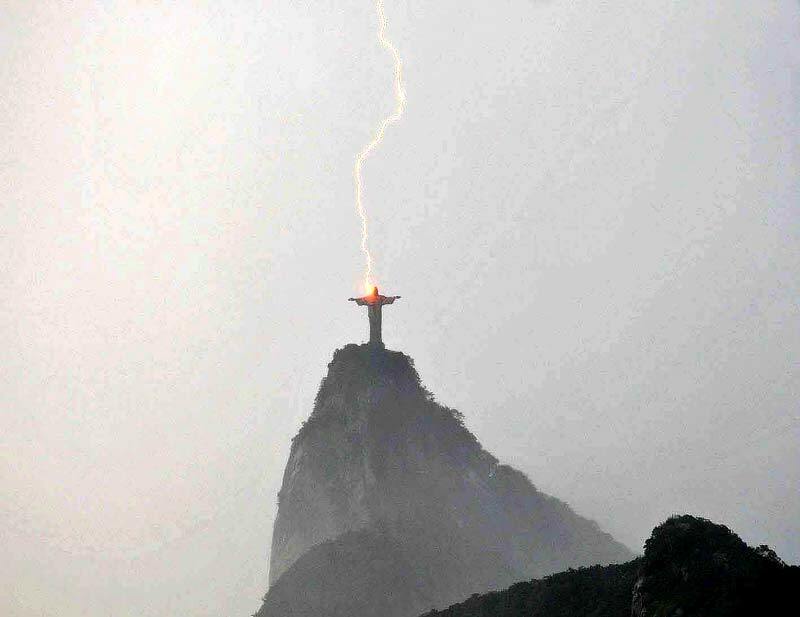 Two years ago, lightning struck the Christ Redeemer statue in Rio de Janeiro, inflicting minimal damage. UPDATE: Our alma mater's new Abraham Lincoln statue also weighed in with a $250,000 price tag. "Actual size" seems like a ripoff for that kind of money, so here's my suggestion: Touchtown Reagan emerging from Lake Winona, visible from Muddy Waters field. Any takers? My only fear about the Touchdown Reagan idea is that the administration might take it seriously. "emerging"--great word because i IMMEDIATELY saw Reagan doing just that, in all his glory. YES. Can we change our mascots to Gippers, too? Or at least add it to the list of eagles, horses, lightning, and knights? I thought long and hard about some sort of witty retort as a way to one-up the idea of Touchdown Reagan, but there's really nothing I can see that can make Hillsdale College better. Why don't they call him Field Goal Jesus? Other appellations for the gaudy graven image include "Drowning" and "Vanilla" Jesus. As a temporary resident of Cincinnati, a city whose residents have an incredible knack for spending money exactly where it is not needed, I really wish Solid Rock would donate that $250K to a worthy cause instead. I've heard parishioners (or their or the statue's defenders) explain the purpose of the statue: "So many people have seen that statue from the highway and have gotten saved." According to that logic, Chargers fans may find themselves leaving at halftime to be baptized in Reagan's shadow. Not that I think the College, or Reagan himself, would mind.